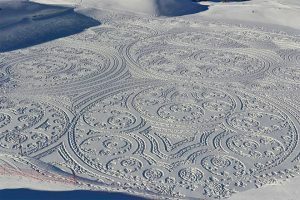 Oxford-educated engineer and mapmaker Simon Beck gets his kicks by making enormous drawings in the snow, and sand, with his feet. 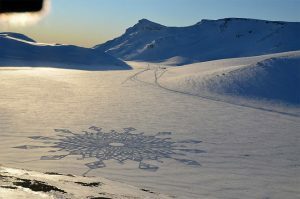 First, he sketches out his designs on his home computer and then hikes out to his chosen site, usually a flat piece of land untouched by skiers who prefer slopes. 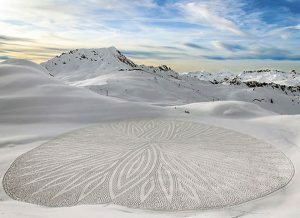 Each piece takes many hours of physical stamina and concentration to complete, sometimes in unforgiving weather. 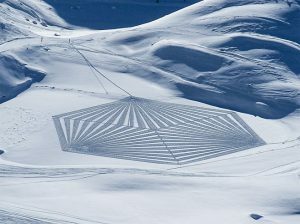 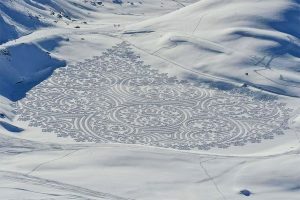 After walking for entire days, he leaves gigantic geometric patterns, spirals, snowflakes and fractals in his wake—often with barely enough sunlight left to snap a few quick photos. 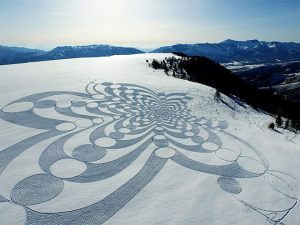 “Usually I work outwards from the center. 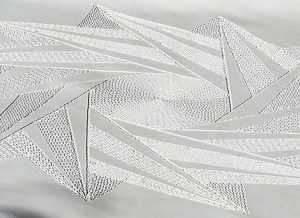 Straight lines are made by using the compass and walking in a straight line towards a point in the distance, curves are made by judgement. 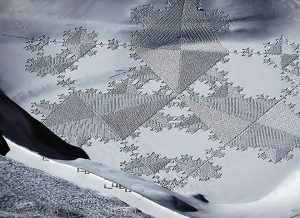 Both require a lot of practice to get it good,” he says on his Facebook page.